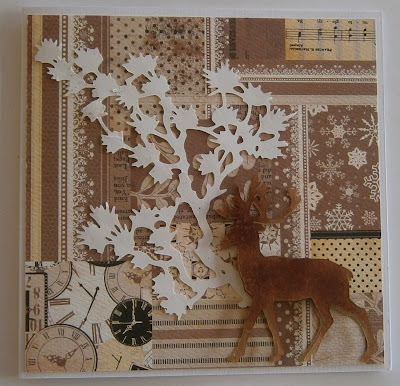 Another die cut today, this one is probably a bit Christmassy but I thought I would include it anyway. 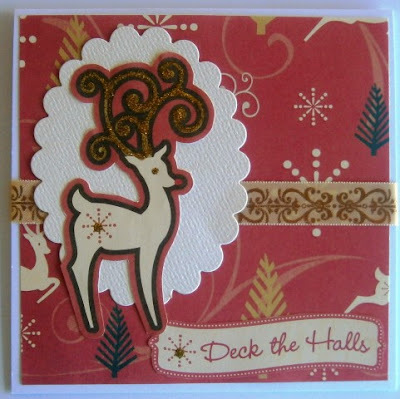 I have used a Bazzill paper for the back ground and inked the reindeer. I have also been playing with some New Laser Cut Overlays from Blue Edge Crafts. The first one is a man's watch and I really enjoyed making this one up and loved the look of it when it was finished . 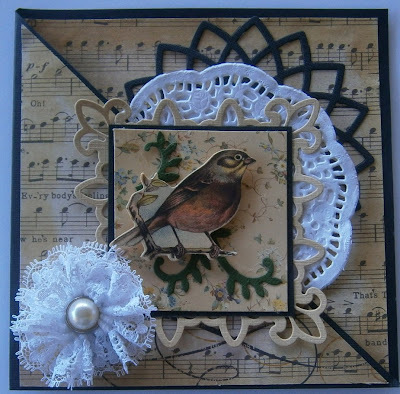 Craft Mad Projects, Tips and Techniques. This months project is a recipe swap which we hope to run until the end of the year. 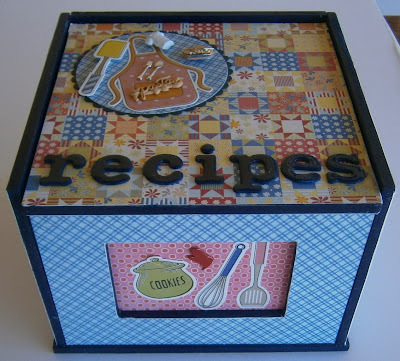 I have also suggested that we make a box/ book/file to keep our collection of recipes. I found the perfect kit amongst my stash of OTP items just waiting to be made up. Lots of photos in this post. This is another of the die cuts I have been playing with I chalked the bird and the branch and added Sticker Store edging and greeting. Recently I have been playing with some new die cuts. 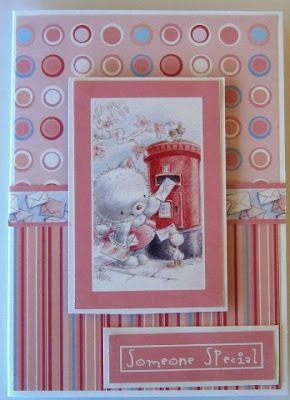 I have used a shaped card from Blue Edge Crafts and stickers and greeting from Sticker Store. 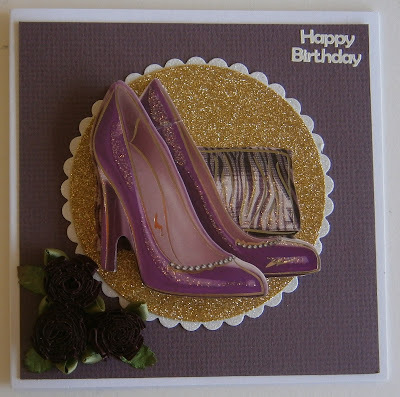 Today I would like to share a tutorial for Cake Slices using the Marianne Designs Cake Slice Template. I have found these are excellent for a little gift at a dinner party, Christmas or a wedding favour. Happy Birthday Slice : The box has been cut in white Bazzill dots and stitched in black and red. A gold greeting has been added to the top as well as punched leaf and holographic flowers which have been raised with 3d tape. Smaller flowers have been added to the side as well as gold peel off stickers. Christmas Slice: The box has been cut in white embossed bazzill and stitched in red. A greeting sticker, star stickers and wreath sticker have been added to the top and red and green star stickers to the side as well as red and green rhinestones. A decorated egg today. This is my clown egg. Ron has cut a triple opening and the egg has been painted, braided, the clown ornament added and I have also added coloured rhinestones on the outside to resemble balloons. The Monthly swap at Craft Mad has been run over two months this time as it is such a busy time of year. The theme for our swap was to use at least one die on each card . 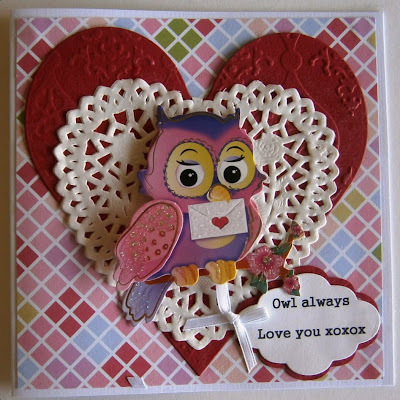 Our February card sketch challenge at Craft Mad has a theme of Love this month for Valentines Day This is my sample card.